Moroso Oil Filter - Lesher Motorsports, Inc.
After many years of designing and testing racing oil systems and related components, Moroso has collected a great deal of information to determine what’s most important to oil filtration. The conclusion was Total Filtration Time! 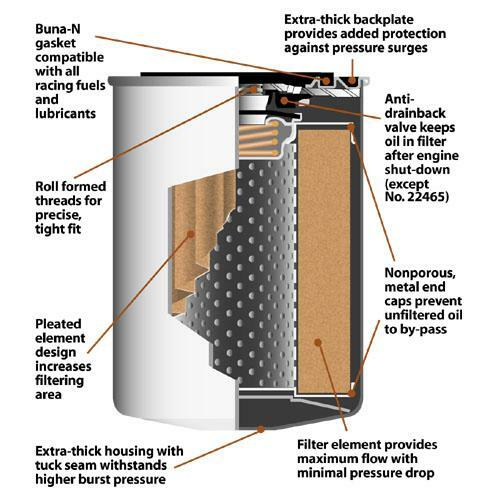 To maximize filter performance, Moroso Oil Filters have a rating of 27 microns, which produces a maximum initial restriction of only 2.5 psi when tested to SAE j806! The result is less pressure drop, more flow, less oil by-pass and maximum filtration performance that’s so important in severe racing conditions.